You are reading this so possibly you are interested in your own website, even a Wordpress site, or at least curious! How I got started on my own website! Curiosity gave me the bug – I love my website and can spend hours with it if time permits. Mind you I do make time permit! Not really work when you are playing with something you enjoy. It seems like play, but I am quite serious about Wessex. 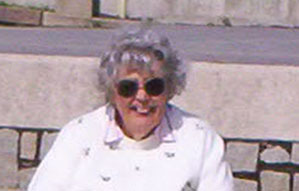 Mary - the author and owner of this website sitting on a sea wall in Dorset. When I first started thinking about having a website, I spent hours researching how on earth to go about it. Did not have a clue. I could surf and email of course but had never got that technical. I bought a copy of Dreamweaver as this seemed to be the way to go and worked out roughly how to use it. This still did not help me as to how a website actually became a business. I was not even sure what I wanted to do with it. There was plenty on the internet, all those get rich quick schemes that really did seem to be too good to be true so I did not get involved with those as they probably were. Did not have the money to waste anyway. Was looking for something useful. To cut a long story short it was not until I eventually found Site Build It that I found some common sense. A system not just a web host. Was rather amazed really after all the hype. Sitebuilder is like a form to fill in and your page is built! On the way one learns how to do it for oneself! Brilliant! Although one does not need to, the form is so easy to use with more or less everything you need unless you get very ambitious of course, then Dreamweaver comes into its own! Of course if one can already understand HTML etc then one can upload one's own web site pages as well. There are two choices - one can have a Site Build it website or one can have BizXpress which is Wordpress type. Both are good, it depends on what you are seeking. This one is a Site Build it website with﻿ all the bells and whistles ﻿that SBI gives with the system. Did not say it was an easy get rich quick scheme, it is not. Of course like everything else the more you put into it the more you get out of it. I shall be 'working' on Travel Wessex for a long time yet I am glad to say! Have a quick sticky beak!! There is a 90 day money back guarantee!!! What hours do I need to put in? Very much up to you!! You can always start in your spare time to see how it goes and then go full time when you have enough income to allow you to do so. Sometimes all one needs is a bit of extra income, a money making hobby, but it can become a full time income if that is what you want. Let us face it one's own website on a subject one is passionate about is a delightful way to make an income!!! No commute too!!! What sort of site can I build? Anything you like apart from sites that usually do not get approval of course. You may have your own local business, that definitely does need a website. What about an Affiliate site like this one? An Information site? This one is. Are you a stay at home Mum needing income? They make interesting reading if you are thinking along these lines. I had not heard about being an affiliate before, did not even know they existed! Talk about plain common sense was my reaction and the book was free to boot!!! An affiliate website is one that sells products for others - like my hotels, car hire and flights, books and gear etc. One gets commissions on everything one sells. My site started as an information type site talking about the places I love, it still is. The affiliations are helpful to my visitors, for their benefit and interest. They are of course the business side of my site as well now. This one is for those folk who want or have a Service Orientated idea. For some businesses it does not matter where in the world you are living. For some of course it is local. Either way it would work. Working at home solves lots of problems particularly for Mums. A real dream for all of us who have youngsters. Who ever has heard of a Masters Course for Work at Home Mums - that is free and is plain common sense. There are a lot of courses we have to pay for - not this one! Definitely not this one!! It has some good ideas. There are a couple of useful how to Masters Courses. Both are pretty handy. The first of these is the knotty problem of making sure your price is right. The bottom line! Not all that hype though. Interesting copy that a visitor to your site would be interested in. Quite fun if you love your subject. There is masses of interest to study on the main Site Sell site. A great deal of reading that helps understanding the whole concept. Very interesting and useful whether or not you eventually decide to try SBI to create your very own website. I heard you!!!!! The first thing I want to know too!!! What does it cost? A very important point that affects the bottom line. Can I as a beginning business afford it? We are all different but for me I cannot afford not to! It is all those things I do not have to do that Solo Build It does in the background that I find useful. All I have to do is concentrate on my site. Solo Build It are the ones that supply me with my traffic stats (delightfully they are coming on!). Solo Build It check for any broken links, a tedious job if I had to go through every one every month to check it was working. Broken links are unprofessional. Look how many links there are on this site!!!! All the forums where one can chat, or get advice for a knotty problem. There is always another SBI'er who can help. They are a friendly lot. One is never alone. (Was a good feeling the first time I was able to help someone else. I was able to give something back in thanks to those wonderful people who have helped me.) Then there are all those searches one can do and so on and so on. Yes that is right!! One's own website costs about $1 a day! Includes domain name of course. One can pay annually or one can pay monthly. Not much to pay for what you get. There is even a free trial. 90 day money back guarantee!!!! Why not compare and see for yourself. Try it - Risk Free. You cannot lose can you!!?? My real hope is that you have as much fun and interest with your own website as I am having with Travel Wessex. Just think - to have your own website!!! Wow!!!! Lucrative and fun - what a combination! You could always ask a question They are a friendly lot!